If a hot hatch is a good thing, and you can’t have too much of a good thing, then a hot city van should be an even better thing, yes? 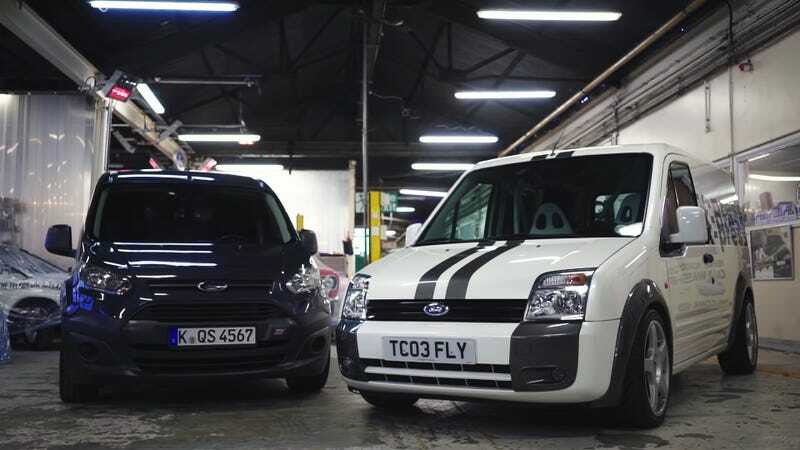 A few misfit Germans with a sense of humor over at Ford added an extra dash of dynamism to a couple of Ford’s Transit Connect models. The prior generation Transit Connect got a dose of Mk1 Focus RS magic, and the next gen got Focus ST power. Both are extremely good vans, as Carfection’s Alex Goy proves in the video below. Hot vans are an excellent prospect, and we need more of them, especially in production. A proper manual transmission turbocharged hatchback-based van is the real deal enthusiast driving experience. And on an even better note, your Amazon packages would probably arrive even faster if all of the drivers were in windowless rocketships like these machines. The closest thing to this that we’ve had in the U.S. market was Chevrolet’s genius, if maligned, 260-horsepower turbocharged HHR SS Panel. And of course, Ford’s current Supervan big boy.